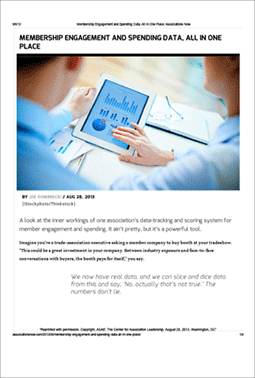 In this Associations Now article, Susan Avery, CEO of the International Association of Plastics Distribution — an iMIS client — shares her strategies for effectively measuring member spending and participation. By having all their data in one central location in the iMIS system, IAPD is able to track and score engagement, thereby providing the organization with invaluable decision-making information. Complete the form to receive your complimentary article.